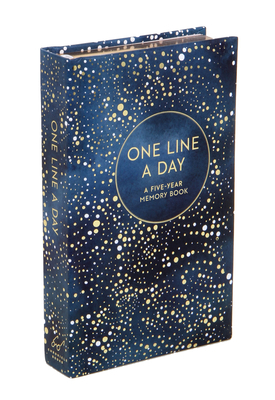 A beautiful new version of the bestselling One Line a Day 5 Year Memory Book, Celestial One Line a Day features dreamy celestial watercolor artwork from artist and designer Yao Cheng and shimmering gold foil stars and gilded page edges. This beautiful 365 day journal will inspire thoughtful daily reflections and become a keepsake record to treasure long after its pages are filled. It makes a great gift for new parents, friends, family and more! Revisit thoughts and memories: This celestial version of the classic 5-year journal and memory book is the perfect way to track the ups and downs and progress of your life, day-by-day, for 5 years. More than a daily diary: Your daily diary entries for each day of the year are recorded five times on each page - one journal entry for each of 5 years on a given date. What were my thoughts on the last 5 New Year's Days? Use the Celestial One Line a Day, 5-year memory journal format to provide an insightful snapshot of your thoughts, memories, change, and progress on each of the 365 days of the year.